Location where Frederick See and his brother-in-law Felty (Valentine) Yoakum were killed by Shawnee Indians in 1763. In 1750 the Zeh/See?Seay family journeyed to Virginia to the Kanawha Valley. Listings of Greenbriar District of county settlers show Frederick See had 480 acres on May 1, 1751. His nephew Felty Yokeham also had 480 acres near him at this same time. Five months later George See is listed with 368 acres, John See with 250 acres. Other See families who came, settled in different counties nearby which later formed into one county. In 1755, many settlers retreated from their Greenbriar settlement due to the English-French War going on around them. Frederick See with his family remained and continued to raise their family of eight children. If there were other children born to this couple, which of course is possible, they are not known. In this time stillborns were common and seldom named. 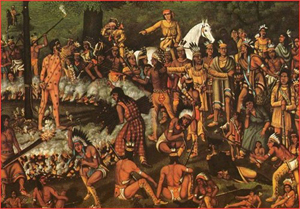 In 1761 those settlers who had retreated returned to find their peace short-lived, because in 1763 the Indians broke out in war and terrorized the Kanawha Valley. On July 15, 1763. The Indians approached the See home under a disguise of friendship. After being kindly entertained by Frederick See, their home was attached. 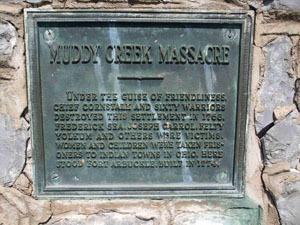 Indians massacred Frederick See, his son-in-law Greenberry Roach, and his nephew Felty Yokeham. The women and children of these and other victims of this massacre were taken prisoners. Leaving the dead where they were slain. The Indians began marching their prisoners back to their campin Olds town, Ohio. The women and children who were unable to keep up were killed. John, the smallest of the See children was quite weak and Catherine, his mother feared for his life. Seeing a warrior riding their horse, Catherine indicated to him that she wanted it. When he refused, she picked up a club and attempted to knock him off the horse. About to kill her, the amused Indians prevented the warrior from doing so, calling her a Fighting Squaw. Once they reached the Indian campgrounds in what is now Ross County, Ohio, it is said the Shawnee had a celebration. The women were forced to sin for them, and Catherine was called upon to run the gauntlet. Grabbing a stick she began making whirling moves swinging the stick, which pleased all the warriors greatly. The prisoners had to share a tent with many old Indian squaws, which left very little room. Captive now for several months and the cold weather was upon them. A child of Catherine's, a son, had to sleep outside with the dogs to keep warm. One day the warriors went off hunting leaving Catherine in charge of all the old Indian squaws sitting around the campfire. One had a fainting spell, falling into the fire. Catherine let her fall, thus making room for her children in the tent, a bravery that helped her family to survive intact. Over the next 2 years all the Sees were released/exchanged/bartered, except for Elizabeth who later became squaw to Cheif Cornstalk's son. George, Michael, John and Mary SEE along with Margaret Yokeham were on a list of 60 prisoners dated 15 Nov 1764 camped at Muskingum while being returned to Fort Pitt by the US Army. Uncle Michael Adam SEE was credited for Negotiations/treaty/ransom resulting in their return. 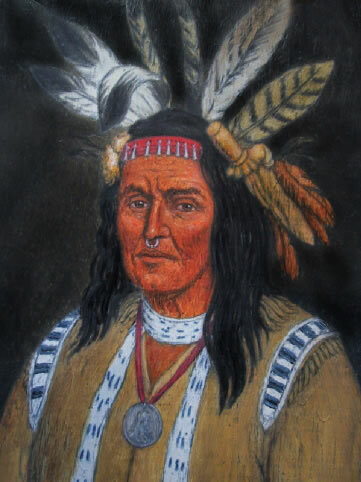 A document written by Colonel Henry Bouquet to William Penn, Governor of Pennsylvania, on November 15, 1764, stated all Indian tribes lead by Chief Cornstalk had at least agreed to release the prisoners. The 150 prisoners were to be handed to troops who would send them to the fort at Carlish, Pennsylvania, where they would be provided with the necessities of life until all were claimed. Records indicate a total of 206 captives were released from November 1764 and 1765. The three sons of Frederick See were taken to Ft. Pitt, Virginia. However, the youngest, John, escaped the first night of his release, rejoining his captors. John See spent several more months with his captors until his Uncle Adam could again secure his release. Tradition is that John's behavior caused his aunt to throw her hands up in despair during her attempts to civilize him. Under the guise of friendliness, Chief Cornstalk and sixty warriors destroyed this settlement in 1763. Frederick Sea, Joseph Carrol, Felty Yolkum and others were victums. Women and children were taken prisoners to Indian Towers in Ohio. 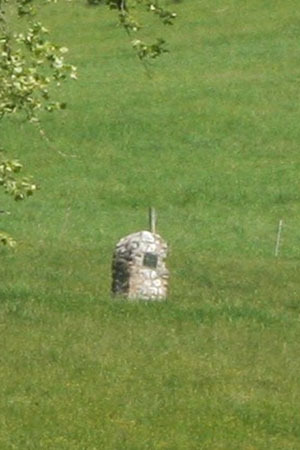 Here stood Fort Arbuckle, built in 1774. The graves of the victims may still be seen in what is known as the McKee burying ground.